Motor Image Pilipinas Inc., the exclusive distributor of Subaru vehicles in the Philippines, formally introduces the Subaru EyeSight Driver Assist Technology for three of its models at MIAS. 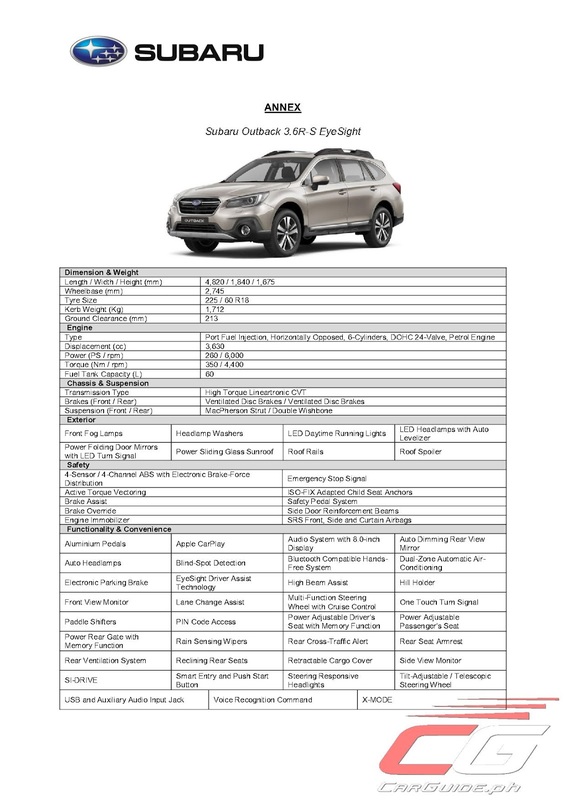 Known and praised for their confidence, comfort, and safety brought about by Subaru’s core technologies such as the horizontally-opposed Boxer engine, Symmetrical All-Wheel Drive, and Subaru Global Platform, the new EyeSight complements these and brings safety to a whole new level. 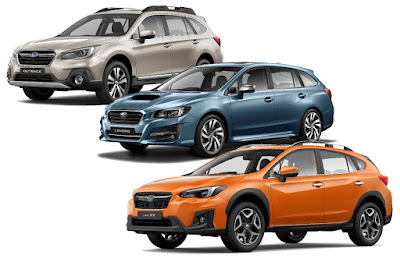 As the fourth pillar in Subaru’ core technologies, EyeSight bring six main functions: pre-collision braking, adaptive cruise control, pre-collision throttle management, lane departure warning, lane sway warning, and lead vehicle start assist. Taking the EyeSight lead is Subaru’s refreshed flagship, the 2018 Outback. The Outback features a bolder, more rugged exterior and a more refined interior. It also has a revised climate control system that cools the cabin quicker and enhanced ride and handling for a more enjoyable drive. It’s also quieter thanks to a short-pitch CVT chain, reshaped exterior mirrors, and new sound-insulating glass. For 2018, the Outback is solely available in one variant: the 3.6R-S EyeSight. With a 3.6-liter Flat-6, this flagship SUV develops 260 horsepower and 350 Nm of torque. The suggested retail price is: 2,408,000 (same as before). The 2.5i-S (without EyeSight) is still available for indent order at P 2,178,000. Next to the Outback, the addition of EyeSight to the top-of-the-line Subaru XV (2.0i-S EyeSight) has made it the safest car ever tested by the Japanese New Car Assessment Program or JNCAP. The suggested retail price for the Subaru XV 2.0i-S EyeSight is P 1,668,000 (up P 50,000 from before). Meanwhile, the base 2.0i (no EyeSight) still retails for P 1,418,000. Finally, the Levorg sports wagon also sees changes this year with refreshed aesthetics, improved levels of riding comfort and quietness, and better safety. Outside it gets the new styling language first introduced in the WRX sports sedan while inside, it has a more upscale interior. Flexibility is also enhanced with the new 40/20/40 split-folding rear seat. In terms of performance, the Levorg benefits from a new ECU tune along with changes to the suspension to improve comfort, steering stability, and steering feel. Available for now with a turbocharged 1.6-liter engine, the 2018 Levorg packs 170 horsepower and 250 Nm of torque. The 1.6 GT-S EyeSight retails at P 1,888,000 (up P 50,000 from before). Sweetening the deal on these EyeSight equipped models, Motor Image Pilipinas is offering up to P 80,000 discount on these three models (even bigger discounts on the Forester). That means, you essentially get the advanced EyeSight driver assist technology for free! I wonder how the system will work here in the Philippines, with all the bastards driving around, motorcycles cutting in front of you, etc. Just a guess... It will probably go awry. The car behind that crashed into the Subie is probably a Toyota. I thought that the 2.5 version of the Outback will still be available at around 2.1m? No EyeSight and by indent order. I thought the Levorg will have the bigger engine already? sigh..
Yeah. I recall automotive journalists and websites were hyping the 2.0L turbo levorg. Where the f*** is it?! Kids, you should f***ing learn to wait. Or else I’ll make sure I’ll spank you and you won’t get your Levorg 2.0.
considering the all new forester will come to PH soon. the base model of upcoming forester price is not that too far from XV TOTL with eyesight. I dont know which to choose. i know its a different category. but which one is better base on the equipped item and technologies, space etc.